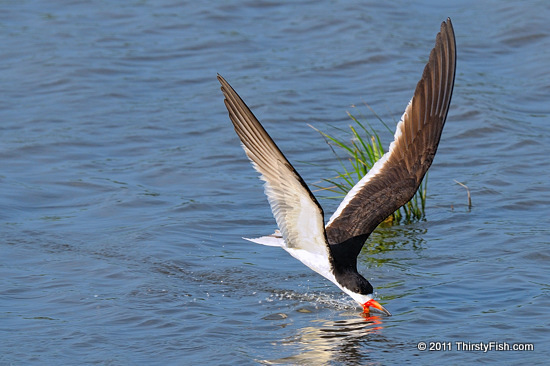 This is another photo of a Black Skimmer hunting. At the area where the above images was taken, there were approximately twenty skimmers hunting together. The first thing I noticed was that they were generally moving from left to right, therefore I adjusted my focus point to the lower right point of my sensor. This yielded many shots which placed the skimmer on the right so that the trail left behind in the water remained in the frame. After a few shots, I reviewed a few images and reduced the exposure since the light coming from the left clipped the highlights on the white undersides of the skimmers wings. I then selected the area/distance where the skimmer filled the frame and visualized the composition. After a sufficient number of shots, I less successfully tried to capture two skimmers in the same frame by selecting an area that would align them up in the same focus plane. In the end, from over a thousand images, I was left with approximately twenty keepers. Why align the focus plane? Skimmers filled the frame at approximately 100 feet (30m). At this distance even with an aperture of f/8 on a 500mm lens, the skimmers would have to be no more than 3-4 feet apart. Skimmers have a wingspan of 3-4 feet, therefore the only way to capture two skimmers in focus would be if they are both an equal distance from the camera.